One long-standing motif of the golden era past by is the old recliner still standing strong in one corner of your house. Most of you remember your grandfather having graced their chair for hours and those few breaks that he would take, you would be jostling with your siblings to stretch yourself on them. Though not the most beautiful looking piece of furniture, it was always comfortable, cozy and utterly comforting, almost like hiding yourself in your granddad’s lap. Perhaps it is this sense of nostalgia coupled with the huge comfort element that inspired modern designers to recreate the sofa in contemporary forms. Today it’s not just another piece of furniture in your living room, it oozes oodles of style and glamour coupled with comfort. You have the ones with a whiff of tradition while others see the twist of modernity. Whatever their forms might be, style with comfort seems to be the core mantra for most designers out there to recreate the old world charm in modern times. From the sleek to somber, the scope of options and alternative while deciding on types of recliners is mind boggling. Nevertheless here are some that are hard to miss. This perhaps is one of the most popular versions. A contemporary leather sofa would be simple way to add elegance and luxury to your living room décor. You can easily choose a timeless piece that would go with your room décor despite the many changes you make over the years.Whether you choose a complete leather cover sofa or a leather one with a wooden frame, it is hard to go wrong on this significant buy. Generous with space, luxurious, comfortable and stylish, these types of sofas easily withstand the vagaries of time without losing much of their sheen. With the choice of appropriate color and texture, they lend unique warmth to your living room and make it hard for your guests to give up their comfort that easily. Their colors too make a bold statement that is hard to miss. While a white leather sofa easily stands for sleek and sophisticated, a black full bodied one is more masculine. 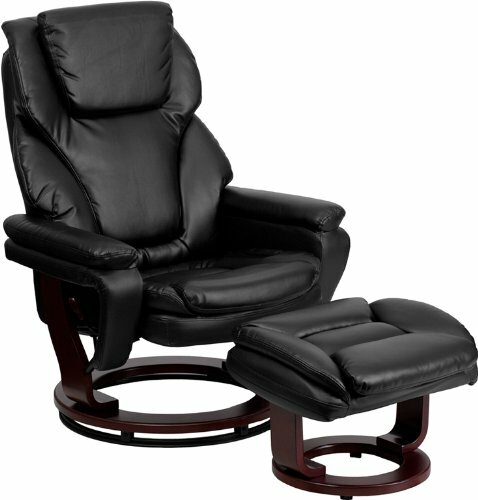 This is another commonly seen version of contemporary recliners, especially in offices and other formal lounge areas. They leave a distinct mark on your guests and lend significant vibrancy to the décor of your room. Inevitably these are ergonomic; they are often built with a swivel for additional comfort and create a specially warm corner in your room. 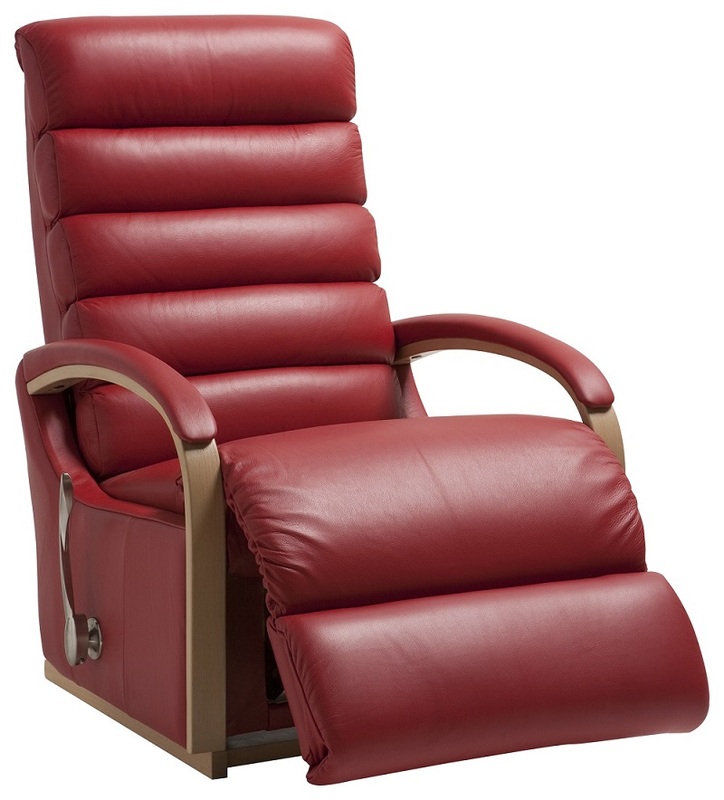 You have many forms like the stress less ones, sleeker, slimmer versions and also some with a support stool to rest your legs just the way grand-daddy used them. These chairs are also extremely adaptive. From being an indispensable feature of your work room to adding that special comfortable and cozy quotient, to doubling up as luxurious seating options to enjoy those private movie screenings with your loved ones, the alternatives and options cease to get exhausted. All you need to do is look around and pick what suits your home or office the best. 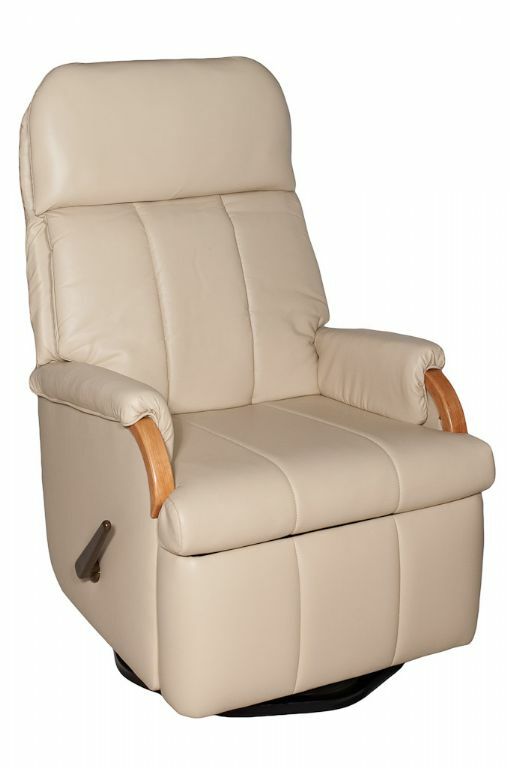 Another interesting aspect of this type of recliner chair is that very often they can even be an innovative alternative to address your posture and back issues if any. Perhaps when we talk of recliners, it is always that heavy wooden frame that comes to our mind. Now what if you had interesting upholstery to overshadow the wooden framework? Yes, increasingly we see a growing trend of leather replacing the contemporary upholstery because of its versatility. 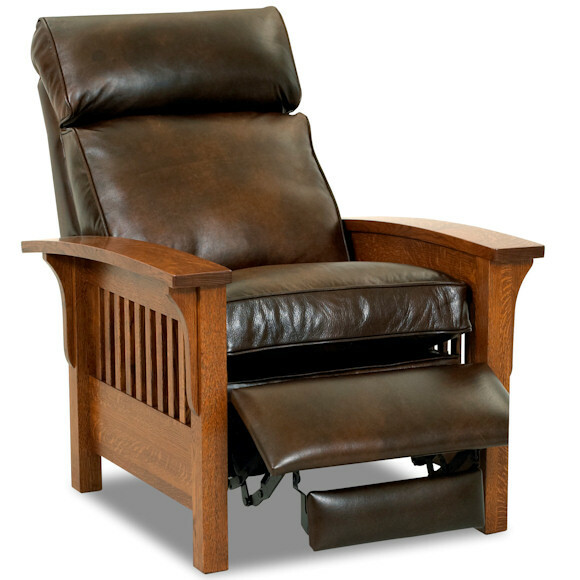 Almost instantly, a leather recliner can bring in sophistication and glamour to an old world concept. Be it vintage design or a modern one, it exudes a sense of superior style and sheer splendor and if you can choose intelligently, there are many designs that transcend the limitation of time, trends and specific design elements. One of the latest to hit the stands is leather with metallic finish pinned to a dark wood frame. Also, it is possible to source the contemporary leather recliners in unique minimalist modern designs and complete leather cover. These serve the dual purpose of being both trendy and easy to maintain. Leather is generally easy to maintain with simple cleaning solutions. Unlike the ones that have clothe upholstery and need elaborate dry cleaning, more often than not just dabbing these with a piece of moist cloth would be sufficient. 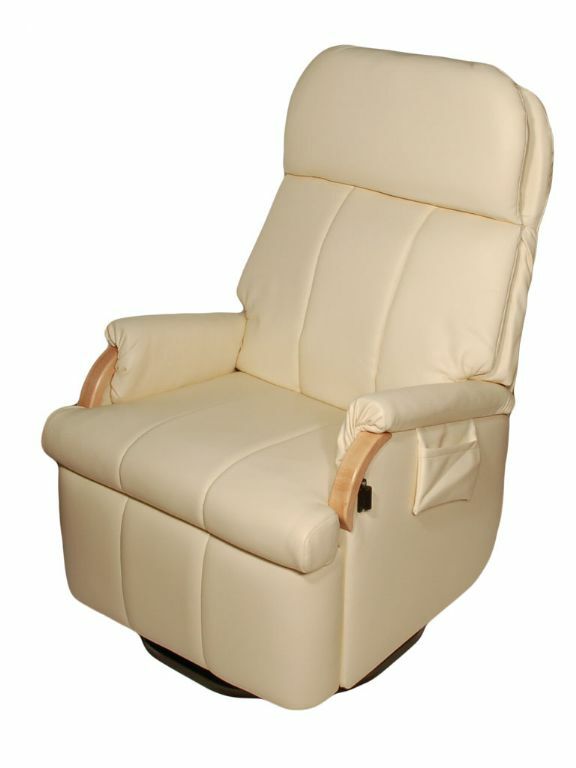 In the context of discussing the various trends seen in contemporary recliners, it is worthwhile to mention that not only are the designs and upholstered interiors that are undergoing a change, even the source material or the main framework has seen many new innovations aimed at enhancing the strength and durability of these recliners. More often than not you can see steel frameworks replacing the old wooden structures that comprised the core of your recliner and was seen as an epitome of longevity. Funky and out of the box themes are increasing becoming the predominant factor in contemporary recliner designs. Not only do these come across a sturdy version but also at times whacky adding a wow factor to your home décor. How would you like if guests walked in and stood dumbstruck with the mouths gaping and gazing at your whacky sleek recliners? That look would perhaps be worth all the money you spent in buying the recliner. Yes, the need to stand out from the group and to add style and fun to the traditional emblems of comfort and coziness seem to rule the perspective of most designers out there to recreate their versions of the recliner. So go ahead get your recliner right away!